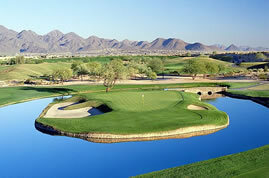 Arizona Golf Vacations: Your Vacation Guide to Arizona Golf Courses, Resorts, Packages and more. TPC Scottsdale, the home of the Waste Management Phoenix Open, is known as one of the top facilities in the US. The resort offers two championship-style courses—The Stadium Course and the Champions Course—fine dining, tour-quality golf instruction, and other luxury amenities. Your Arizona Golf Vacation Guide! Arizona is home to over 300 golf courses. One of the primary reasons Arizona has developed into one of the world’s top golf destinations is that the average temperature during the winter months is 70 degrees. The warm winter weather is absolutely perfect for golfing in Phoenix, Scottsdale and Tucson during this season. With over 300 days a year of sunshine, Arizona has developed into a desert paradise that attracts millions of visitors per year. A true golfer’s heaven, the city is home to some of the most highly recognizable golf courses in the country. A partial listing includes, Troon North, Boulders Golf Resort, Grayhawk, Wekopa as well as TPC of Scottsdale, home of the 2010 Waste Management Phoenix Open. The tournament formally known as the FBR Open brings over 500,000 spectators daily and is generally considered the largest social golf event in the world. 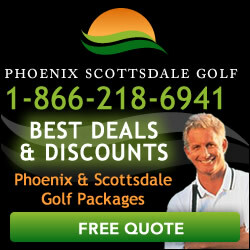 ArizonaGolfVacations.com gives you all the information you need while planning your golf vacation to Arizona. We feature up to date reviews on the best golf courses in Arizona along with local golf news, Arizona golf course maps, packages and information on State Parks, Attractions, Tours, Shopping and restaurants in the area. Our extensive golf course and accommodations guide will help you choose the best golf courses and lodging in Phoenix, Scottsdale and Tucson for your next golf vacation to Arizona. SunRidge Canyon Golf Club is one of the most scenic desert golf courses in the state of Arizona. Located in Fountain Hills 30 minutes east of Scottsdale, this desert jewel will dazzle you with descending elevation changes as you make your way down the canyon followed by rapid ascending elevation changes as you rise back up the mountain. The Carefree Resort and Villa is located in the city of Carefree, AZ just north of the city of Scottsdale. Visitors for all over the world enjoy Carefree Resort for its peaceful location and décor of the Old West.